criticality in the brain. 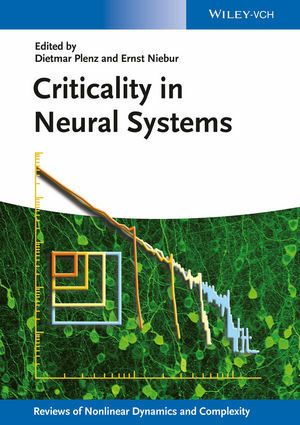 Subsequently, important breakthroughs in modeling of critical neuronal circuits and how to establish self-organized criticality in the brain are described. A milestone publication, defining upcoming directions of research in this new fi eld and set to become the primary source of information on the brain and criticality. DIETMAR PLENZ is Chief of the Section on Critical Brain Dynamics in the Intramural Research Program at the National Institute of Mental Health. He received his Ph.D. in 1993 at the Max-Planck Institute of Biological Cybernetics and the University Tuebingen. Dr. Plenz joined the NIMH as an Investigator in 1999. He pioneered the development of in vitro networks to study and identify the emergence of neuronal avalanches in the brain. ERNST NIEBUR is Professor of Neuroscience and of Brain and Psychological Sciences at Johns Hopkins University in Baltimore, USA. He holds degrees in Physics from the Universities of Dortmund, Germany and Lausanne, Switzerland, and a postgraduate certificate in Artificial Intelligence from the Swiss Federal Institute of Technology (EPFL). Prof. Niebur has authored more than 100 scientific articles in physics and computational neuroscience. HEINZ GEORG SCHUSTER is Professor (em.) of Theoretical Physics at the University of Kiel in Germany. At the beginning of his academic career, he was appointed Professor at the University of Frankfurt am Main in Germany. He was a visiting professor at the Weizmann-Institute of Science in Israel and at the California Institute of Technology in Pasadena, USA. He is author and editor of research monographs and topical handbooks on chaos theory, nonlinear dynamics and neural networks, but also on popular science books, and editor of a Wiley series on Nonlinear Physics and Complexity. Criticality At Work: How Do Critical Networks Respond to Stimuli?